Have you grown weary of everyone talking about mindfulness all the time? If so, you’re not alone. Not because I don’t think mindfulness is great – it’s awesome and powerful. I think the weariness comes from people overusing the word and applying it to anything that resembles relaxation or coping. Mindfulness in its purest form is focusing your awareness on the present moment with acceptance and without judgment. Constantly bringing your attention back to the here and the now. That is mindfulness and that is the discussion in Julia Cook’s newest (wonderful) book: Be Where Your Feet Are. While reading this book, I could almost feel myselfcringing because it was essentially describing my own jumping thoughts and multitasking ways. 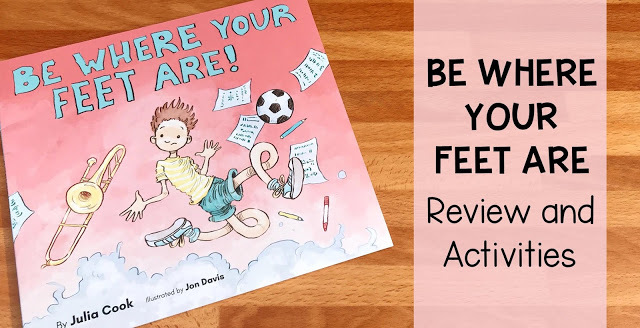 Be Where Your Feet Are (affiliate link) is about a boy whose mind hops around from idea to idea…and he struggles because of it (failed math test, awful soccer game, frustrated mom, etc.). It also speaks to the fact that our kiddos often have a lot on their plates. 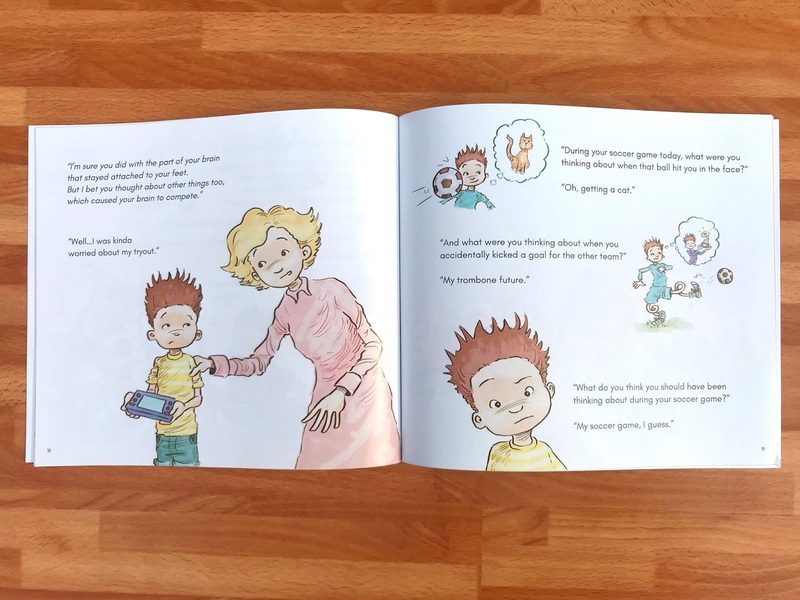 The story, in true Julia Cook fashion, involves the boy’s mom teaching him the lesson – in this case: BE WHERE YOUR FEET ARE. I have to admit that I had never heard this phrase until this book was announced and I really love it. His mom points out that the most successful part of the day was the part when he was totally present. The boy takes her advice and, of course, he has a better next day. 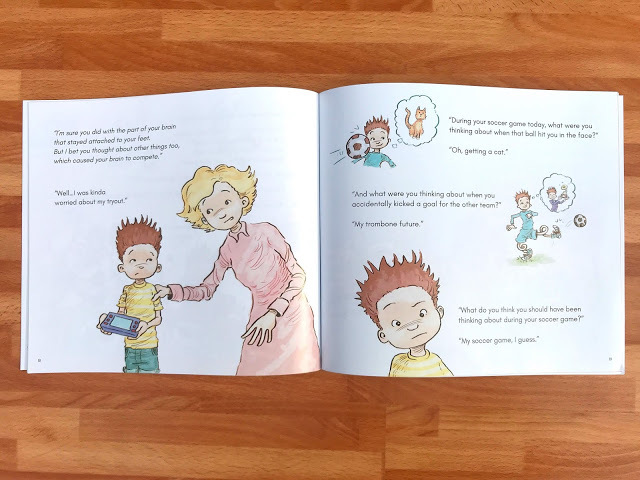 One wonderful thing about this book is that it is simple and kid-friendly in its depiction of mindfulness. The vocabulary feels accessible and while the story is 31 pages long, it didn’t feel overly wordy. I also loved that it talked explicitly about multi-tasking as well. The book feels like a great fit for 2nd-5th grade students and could be used in small groups or for whole group lessons. I’m also envisioning this as a great early year read for counselors who plan to start the rest of their lessons with mindful moments. Side note: My mother in law was in town when I received these and she picked one up to read and commented on how much she too liked the message. 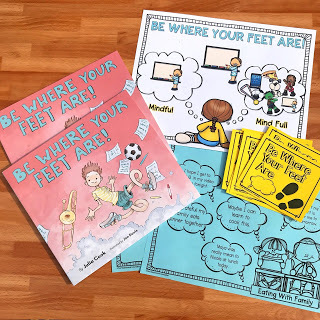 Mindfulness is tricky – and so I think reading the book is an awesome starting point (or reinforcement if you’ve already begun discussing this topic) but that kiddos need more discussion and practices to really “get it.” I created some resources that partner with this to use in lessons in order to help students better understand how to be mindful. One activity I’m going to use will have students physically feel the difference between focusing on one thing vs. multitasking or thinking about many different things. You can do this by taping different colored pieces of paper spread out on the floor or by using pages that have different graphics on them. Ask students to literally “jump” from topic to topic, thought to thought. Then tape or layout pages with the same graphic on them (or same colored paper) and ask students to walk along the straight path to illustrate how much easier it is to stay on the same idea. 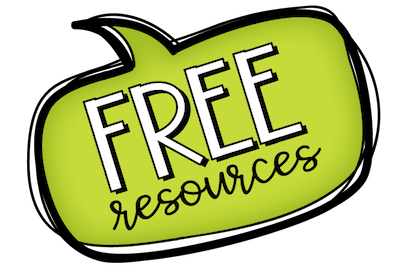 It’s also helpful for students to see and practice with additional examples and situations. The resource I made includes sheets showing different scenarios and thoughts that can occur with them. Students identify (individually, in small groups, or whole group) which thoughts show the character being where their feet are. I also made some task cards to use with my students to help them 1) practice using strategies to help them be more mindful and 2) discuss the concept in some more depth. 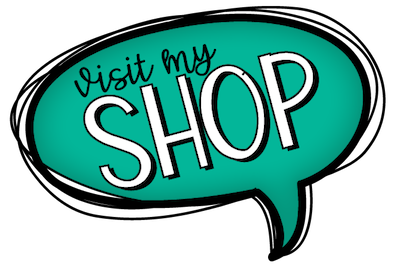 You can find the activities in my TpT store by clicking the picture to the left. 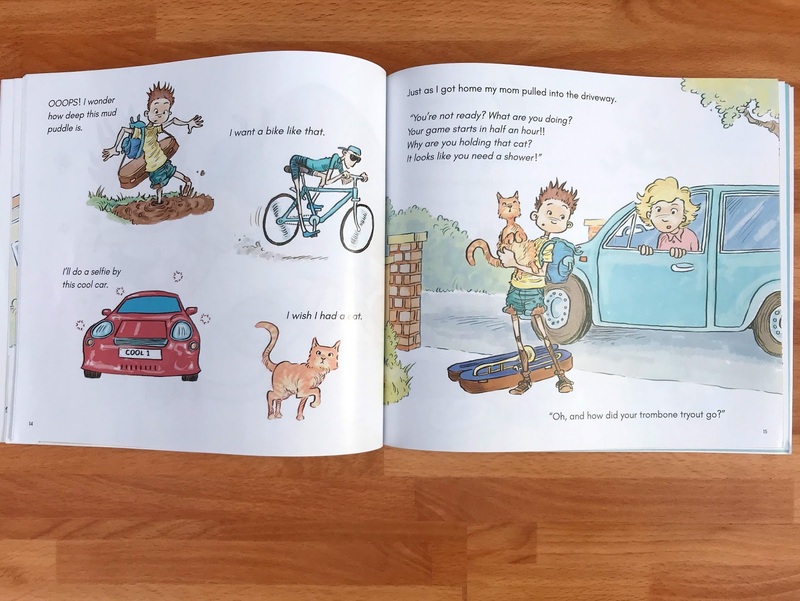 And now…for some extra excitement (beyond the release of a new Julia Cook book which gets us youth workers all in a joyful tizzy)…a giveaway! I have TWO copies of the book to giveaway and will email the companion activities to the winners as well. Just comment on this post to share what (if anything!) 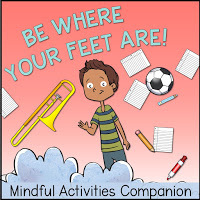 your school or your school counseling program is doing with mindfulness and you’re entered! Disclosures: I received free copies of this book in exchange for an honest review. All of my views are my own. I’ll only ever review and share books that I think are great and that I do or would use with my own students. You must 18 years old and a resident of the United States to enter. Giveaway ends at 12am CST Wednesday, August 1st. I did a mindfulness activity before each classroom lesson this year. Sometimes it was teaching the neuroscience of the amygdala and prefrontal cortex and sometimes it was doing a go noodle, mind yeti or smiling mind…sometimes a youtube video that included a visual with breathing exercises. I hope that my efforts taught students how important it is to STOP and be in the moment so that they could cope with stressors, testing and experience peace. I plan on doing Mindful Mondays on the announcements this year. Love this saying. Activities are very cute! Key ring with mindful activities/scripts that teachers can use to bring their students back to the present. our entire staff have attended professional development on mindfulness. After this many of our teachers have implemented mindfulness exercises in the classroom. Hi! 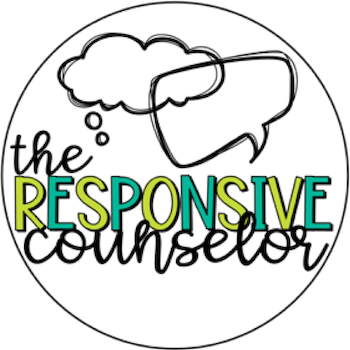 I am new School Counselor at two rural, low income elementary schools in Ohio. I plan to incorporate mindfulness in my program ( that I building from the ground up.) I have no idea what my budget will be, so a free book would be a wonderful surprise! This book looks like a great addition to my mindfulness story book collection. I’m at two new schools this year so I will have to start from the bottom with teaching mindfulness again. Another awesome Julia cookbook! I am a middle school counselor in a suburban NJ school. Every year I run “Stress Less” groups and infuse them with mindfulness activities every session. Participants usually tend to be those who are over booked and over anxious. I usually have to run many sections of the group in order to meet the needs of all of the students who express interest in the group. We also have an emphasis in mindfulness throughout our counseling curriculum and program. Every year students are more and more stressed with the pressures of society, and those they press on themselves. Fifth and sixth graders love Julia cookbooks just as much as elementary students do! Can’t wait to cover this book with them this year! One of our most effective uses of Mindfulness is incorporating Mindfulness times into our daily schedules at high energy times, especially when students are entering the classroom after lunch or recess. I love this idea! I've only taught mindfulness in small groups. This year I'm teaching coping skills school wide. I agree mindfulness is a great way to begin a lesson and helps focus the class. I'm excited to read this book! I'm so excited to read this book! We've done mindfulness lessons and activities during our school-wide multi age character ed groups including yoga and guided relaxation videos, mindful eating, coloring mandalas with calming music, noticing sounds, etc. Many teachers have continued to practice pieces of this in their classrooms. I also try to add in mindful moments, gratitude, breathing, etc. during classroom guidance. Thanks for the thorough review. I am using mindful yoga with my older students and they really enjoy it. I am trying to implement in the curriculum as a strategies class so that all students will have a chance to learn the techniques an apply them when it is TESTING time! I also use a mindful toolbox for my younger students and they seem to enjoy the role playing and what if activities.